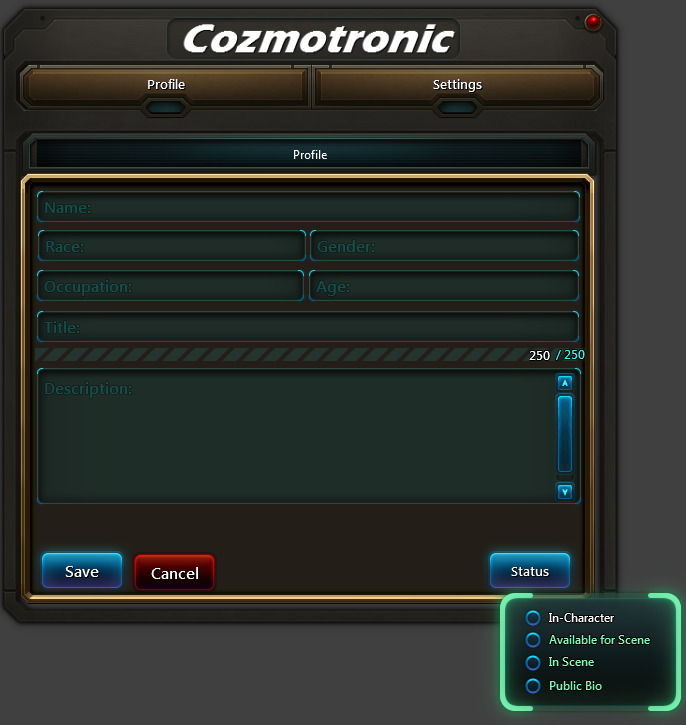 Been a long time since I posted here, but after talking with ToggleButton about PDA, I decided to follow his advice and get the entire RP Community of WildStar involved for the development of Cozmotronic, PDA's successor. I've been collecting information over Skype, Tumblr and the forums on what people actually want, and I think it's only fair if the Addon becomes driven by the Community that is going to be using it. So I will be using this topic to keep track of wishes and requests for the Addon, and update it based on feedback collected. Based on the feedback, the following information will be tracked by the Addon. For this there's going to be a "Profile" Window. This is going to be tricky. I've already started working on a design, but was informed by ToggleButton that it looked too much like the original PDA version 1, and that it was not liked by people. If people could voice their opinion about that, I would appreciate it. If people can make a better layout, or have suggestions, then by all means show me a screenshot from it, and povide the potential XML file generated by Houston. Credits will be given in the Addon where due. Outside that, really looking forward to receive more feedback and get this Addon going. My only question is will it have a similar sort of IC reason for us having this information, or will what we learn about others using Cozmotronic be completely and totally OOC? I don't really get the question. Isn't that depending on how you use it with your character? Well height, weight, race, that's all info that's easily seen from just looking at someone else IC. So that info is 100% good to have. Occupation, a little sketchy but maybe just something for someone to OOCly find a hook for RP with someone? As for the "title" that can be used for lots of things...descrpition of what folks do that everyone can see, letting people know about smells, or other things is also good! The description area would be for other things...like Kali has markings that cover her, I use that are to describe that so I don't have to type it out 100 times a night, same with her speech and any other things that we can't show on our toons. So yeah, it has a lot to offer in this basic form for sure! PDA had the huge Bio section, which I don't think was entirely necessary other than for people to read up on stuff OOCly, since most of that wouldn't be known to other characters at all. Looks good and straight forward, easy to use and understand. Also what Kalita said^^^. So nice of you to step up on this Olivar! My opinion doesn't mean much. I'm just glad there's a replacement. But here it goes anyway. I've never really got the point of using the In Character, In scene or Available for Scene... I've never switched it to be honest and I've never viewed that as a factor when approaching someone from RP. Also, wouldn't' you want to assume someone's bio is public? Having PDA/Cozmotronic installed and not having a public bio would be ... contradictory. In conclusion, I would reason that those options can be omitted without much consequence. Instead, if possible, please increase the character limit. :3 1000 sounds like a lot but it's not. This post alone is over 700 characters. I guess I'm one of the few who appreciated seeing smaller descriptions and not 50 Shades of Spew in one window. If the addon IS considered in-character, you wouldn't have to need to write out every little detail. That said, I enjoyed the description and biography segregation of PDA. I also liked having the URL field as it made it a lot easier to find character profiles and character tumblrs, so I hope you'll consider reinstating that. That said I really don't think more than 500 characters is necessary, how much do you need to describe that someone would be able to see? I've always seen it as a quick reference...can scan it, react to whatever and move on. Too much and you're stuck reading too much. I will add the URL again. About larger description fields, this will require testing when implemented. The new ICommLib has throtthling, so I do not know what the limit is going to be on sending messages over the channel to get the information across. My suggestion is keep things small and generic. Fields that are specific to a 1 or 2 races are better served by putting that info in the description box. Otherwise you'll get a cluttered and complicated UI.